I purchased these melts at my local Walmart where it’s really hard to resist all the scented goodies in their wax section. It’s also nice since you can smell all the fragrances before purchasing. Don’t like Walmart? No worries. You can also purchase ScentSationals melts through their website if you prefer the online route. You’ll pay $1 more per melt pack but you can catch some sales every once it awhile. The label for Honey Bourbon Frosting pretty much sold me… it showed a vanilla cupcake with swirls of buttered frosting on top. YUM!! Smelling the wax helped as well… it smelled light but I could make out a sugar and sweet vanilla and yes, I’m pretty sure I could even smell a touch of bourbon. Very interesting. 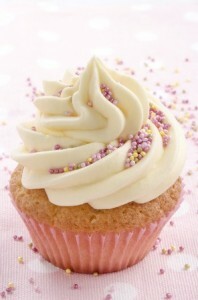 I’m a huge bakery vanilla fan and love frosting scents even more so I had a feeling I was going to like this fragrance. So… I went ahead and purchased several to test and review. Butter, Sugar and a touch of bourbon. Simple description but accurate. To me, the wax did smell sugary with sweet and creamy vanilla blended in. I’m hoping the bourbon notes come alive once the wax it melting… time to find out!! I used the entire clamshell pack in 2 electric melters in my great room. One melting, it took a good 20 minutes to really start noticing the fragrance and once I did…. YUM!! This fragrance smelled like creamy vanilla frosting. The bourbon was pretty much lost in the mix and I was okay with that since the overall scent was still delicious. Just imagine sweet buttery vanilla frosting. That’s what this fragrance smelled like to me. Strength – on a scale of 1 to 10, I would rate this scent a 7. It wasn’t super strong but gave a nice and steady medium scent throw. Would I have preferred it stronger? Yes but it was till pretty decent. I liked this fragrance and will for sure purchase it again. 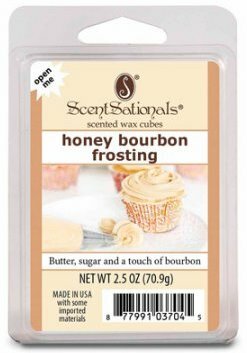 Have you tried Honey Bourbon Frosting from ScentSationals? Review it with us. In the comment section below, review and star rate your experience… it’s easy! Scent description - Butter, Sugar and a touch of bourbon.